At EduCon this past weekend, we had lots of conversations about social networking and personal learning networks, and especially about how to bring our students, colleagues, bosses and others into the mix. However, I’m not sure wikis, Twitter, live blogging, Ning, Skype, and the other tools we were using are the right ones to introduce newbies to the concept. I’ve been thinking about all this as I finish tomorrow’s presentation for some of our librarians here in the overly-large school district. The session is advertised to be about managing information overload using Google Reader and Delicious (feel free to rummage through at my resource page). But these tools are more than data containers. Their sharing capabilities make them entry-level social networking tools based on concepts (subscriptions and bookmarks) that, hopefully, are easier for beginners to grasp. Anyway, that’s the latest angle I’m trying. We’ll see how well it works. I wonder what the next stage in the process of succumbing to network addiction should be? It’s no secret that most major newspapers in the US are losing money. While some will disappear altogether, a few are shutting down their print version and trying to figure out how to build a profitable business on the web. With that as a background, the excellent NPR program On The Media has a segment this week about a new dead-tree publication called The Printed Blog that will use material drawn from blogs, flickr and other content sites. The first editions will target three neighborhoods in Chicago and one in San Francisco with plans to expand to New York soon. The founders hope that a combination of “hyperlocal” content with very cheap advertising (and a price tag of free) will be a financial winner. After introducing the concept, the interviewer went on to ask the exact question I was thinking. Now, I can see how this is in many ways just another form of aggregation, like the Drudge Report or Fark or even Google News only in printed form. But isn’t it also kind of the worst of both worlds? You’ve got blog content minus the immediacy minus commentability minus correctability, all distributed the slow and expensive old-fashioned way at high cost. Certainly there is some valuable writing being produced by bloggers (not necessarily this one) and I’m not one of those who believes the printed newspaper is going to totally disappear. However, I doubt that repurposing content that was intended to be interactive with a medium that is far from it will help newsprint survive. News about the economy seems to get worse every day with the many reports that large numbers of businesses will likely close up shop before this is all over. Today was Circuit City’s turn to announce it will go belly up. All of this got me thinking about the free or absurdly inexpensive tools and resources on which I (and many others) have come to rely. WordPress, Firefox, Delicious, Twitter, Flickr, NetNewsWire, ecto, Twitterrific, Google Maps/Earth, Google Reader, lots of other Google stuff. Even the hosting service for this rantfest costs me less than a decent hamburger every month. Will these and other companies providing and supporting a vast array of internet tools be able to survive the current economic mess, especially in light of the fact that many have no visible means of financial support? Going beyond simple personal use, there’s also the situation where many of us are actively recommending these resources to our colleagues and others. Should we be concerned about getting them hooked on something like Delicious only to find it splattered with billboards, or worse, gone altogether. After all, even giants like Google have been shutting down some of their projects. Other “old reliables” are trying to generate revenue by inserting ads into their free resources and charging for “enhanced” services (WordPress.com and EduBlogs quickly come to mind). So, am I being paranoid (selfish?) or is anyone else concerned about web 2.0 going bust? What tools would you miss if they disappeared? The Washington Post is trying to sell classified ads in which people can send their “words of welcome” to the new president. 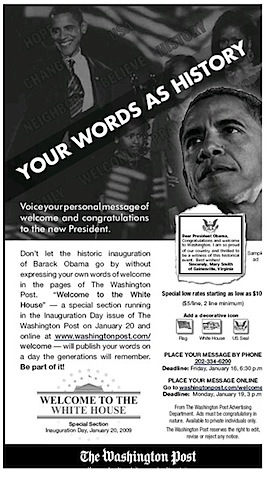 The notices will printed in the Inauguration Day edition on January 20th and prices start at $10. Of course, anyone with a web connection could post the same message for free on Craig’s List (or any number of discussion boards) and, potentially, be read by more people than will see the special section of the Post. They also wouldn’t need to worry about the fact that “The Washington Post reserves the right to edit, revise or reject any notice”. Am I missing something or is there really some greater value in putting this kind of message on paper? I mean other than to add desperately needed cash to the bottom line of the Post Corporation.